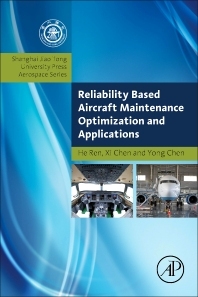 Reliability Based Aircraft Maintenance Optimization and Applications presents flexible and cost-effective maintenance schedules for aircraft structures, particular in composite airframes. By applying an intelligent rating system, and the back-propagation network (BPN) method and FTA technique, a new approach was created to assist users in determining inspection intervals for new aircraft structures, especially in composite structures. This book also discusses the influence of Structure Health Monitoring (SHM) on scheduled maintenance. An integrated logic diagram establishes how to incorporate SHM into the current MSG-3 structural analysis that is based on four maintenance scenarios with gradual increasing maturity levels of SHM. The inspection intervals and the repair thresholds are adjusted according to different combinations of SHM tasks and scheduled maintenance. This book provides a practical means for aircraft manufacturers and operators to consider the feasibility of SHM by examining labor work reduction, structural reliability variation, and maintenance cost savings. Dr. Xi Chen, a graduate PhD student from RMIT University, Australia, and postdoctoral fellowship in Shanghai Aircraft Customer Service Centre of COAMC.